Backed by the team of experienced professionals, we are able to manufacture and supply a precision engineered range of Gas Flooding System. 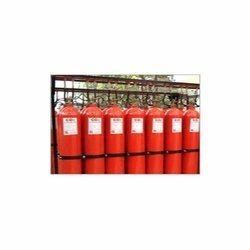 This flooding system is designed for controlling the fire with the aid of specific gas through suppressing the content of oxygen in the space and act as a fast fire mitigation agent. The offered flooding system is provided with electrically non conductive and creates no relics. Suitable for both, residential and commercial sectors, this Gas Flooding System is available in different specifications as per the needs of our clients.